Grew up riding single fins before thrusters were invented, haven't ridden one for decades. Thinking about buying a Hot Buttered double flyer swallow, owned one in the 70s. Back then your standard board was around 6'6". Not sure whether to go for one around the 6'4" for bigger days or opt for smaller 6' and try and ride it in a variety of surf? Thruster would still be my everyday board, just feel like a change some days and single fins flow down the line nicely. But as I remember those 70 single fins, with wide point forward and pulled in tail were dogs in beachbreaks, but great on points/reefs. but have MC put a centre box in it. Then run it with fcs bonzer sides and a 6.5" centre. Old school carving and loves the pocket but is a clean waves board. Bugger single fin only boards. 2+1 opens up so many more possibilities. Cuttles, how big is yours?. Beerfan wrote: Cuttles, how big is yours?. , i have a dan mcdonald shape called a "crumpet" he makes a few as a single fin but i got mine as a 2 + 1 set up because i prefer a bit more drive than the single fin offers. I have been extensively demoing cuttlefish"s fin collection , i tried the greenough fin and a revolution spitfire fin (which i quite like) but settled for the bonzer sides and a 6.5 shapers centre fin. The bonzers really liven the board up. Check out dms shapes on the net, its a great board and i like the large diamond tail. Mine is a bit chunky 5"11x21x2 3/4 but paddles like a dream on the points up here....and loves point waves (think NPJ in glass love). However, its more of a fishy board and thus is more of an alrounder than the MC70t.....the MC is beautiful point/quality wave board tho. One single fin that i really like is the simon jones morning of the earth MP kirra model.....andrew kidman featured the original in his movie lost in ether. Beautiful looking board and a well thought out design. It cannot be a single board quiver. Just don't have the drive of a thruster. Personally I'd take a single fin over a thruster or twin anyday however it would need to be a day when the waves have some juice and wall to play on. For run of the mill beach break the single fin just doesn't have the puff. Jam I think we have met, via a yellow single fin McCoy. Ah you asked what single fins I have a few. 6'0 double ender not too different to the zap when waves too small. But steady in a good drop. 6'2 Bear FAW (2+1) with cutaway centre. Never clicked with it. In board bag ready to sell. 6'6 nugget ( thanks Jam) only one that could substitute for a thruster. Large and volume enough for some power in small stuff and very steady in head high. 6'6 double ender (head high fatty walls and this is heaven) the first single that inspired me to get the others. 2ft Beach break forget it. 8'0 nugget. Small days. Very good. Plenty of paddle power. Loose for an 8ft board. 9'2 pin tail mal. Ridden 3 times. Just not me, but was fun when I had it out in 2 foot beach break. Hassle to store so hangs on a wall making it difficult to get and just take for a surf. I have a 6'6" McCoy nugget single fin I rarely surf. I do enjoy surfing it, from maybe 1 foot to 3 foot. It will surf bigger but it's volume gets in the way for duck diving.i love having it in the quiver. Not really short but i have a 7'2'' Diverse Widowmaker. Haven't spent enough time on it to feel it out properly, though i did get some decent little bit overhead waves on it, however i had it setup as a thruster then haha. 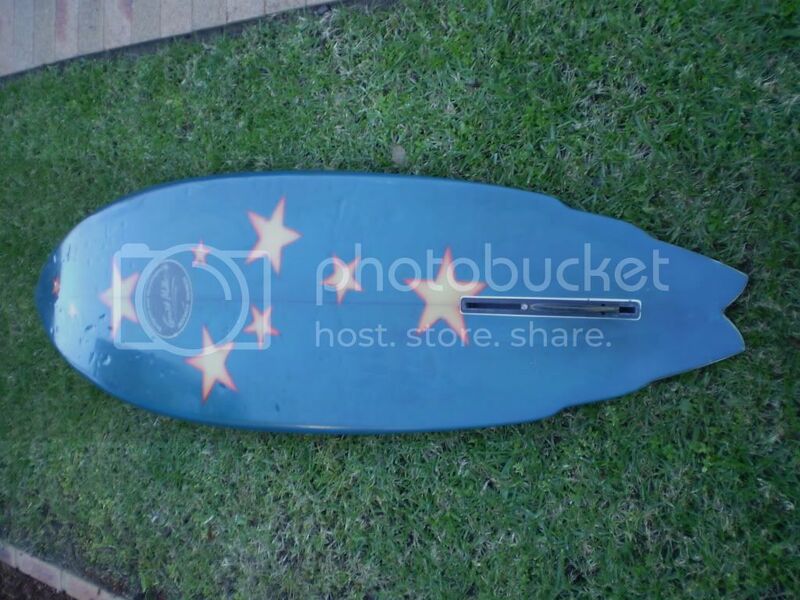 Its on loan at the moment, but i have an 8'' soulflex fin waiting for it, to sompare with the 8'' dolphin i have in it now. I must admit, i just got a JD twin fish, which im in love with, so can't see me swapping boards for a while. Although coming into winter the widow would be a better choice in overhead and punchy. Might have to pinch it back!! 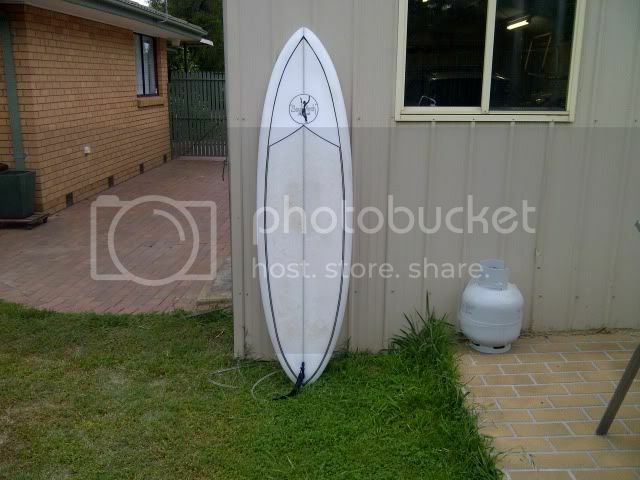 my 9'1'' jackson with a 10'' Big Kahuna dolphin fin is frigging awesome, love the feel of a big board with a big fin!. I couldnt agree more with Glamarama. I have a 6'2" eggy single thing. Brilliant board with beautiful flow and carve when the conditions are clean. Its simply the best paddling board I have owned too, even better than my old 9 foot odd Mal, and will paddle into any tiny little bump you can think of. But it is hard work in normal messy beachbreak conditions, and I seem to find it lacking a bit of drive when I want it (which probably has lots to do with the pilot!). I've been contemplating sticking some plugs in and making it a 2+1 - will this give it back a bit of thruster type drive, or will it just f&^k it?? 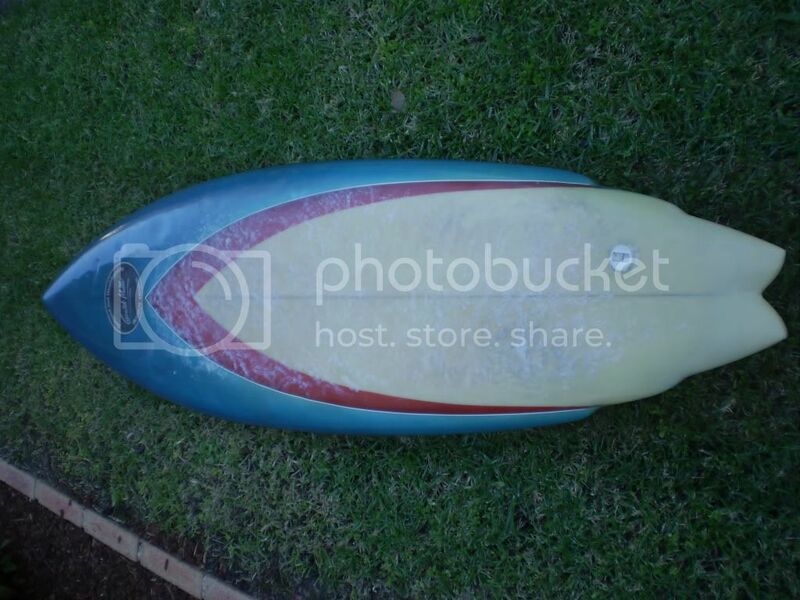 Here are some pics of my first ever surfboard. Shaped around 1980 by Grant Miller. 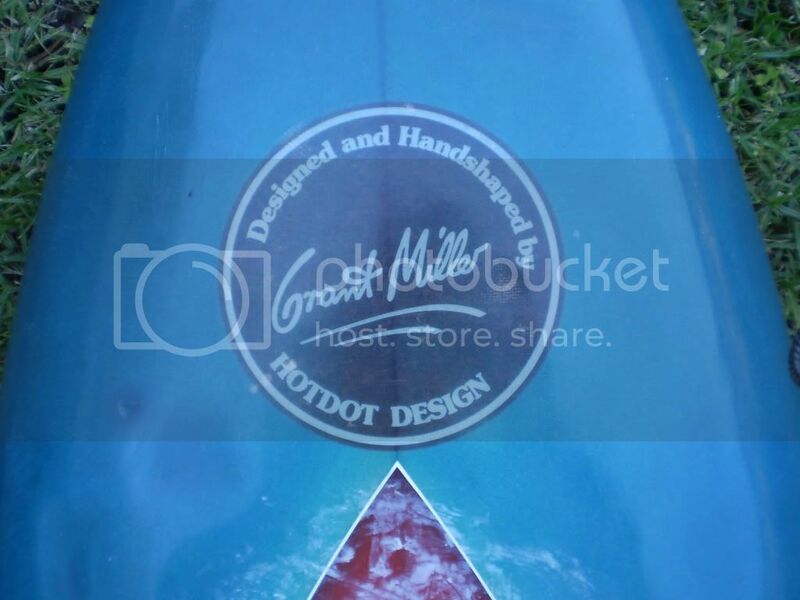 In fact it is one of the very first boards Grant ever shaped under his own logo after working for Terry Fitz at Hot Buttered for some time (according to Grant). You will notice it is a Terry Fitz shape, however with Grant's logo. The board has been used as cricket stumps during childhood days of backyard cricket. Hell we even took the fin off it and rode it down some grass hills as kids, and my step brother even belted the next door neighbour with it (hence the slight chip out of the fin). The board is in pretty good condition given the hell we gave it. Solid as a rock. I lost contact with this board for many many years however I managed to track it down some years ago (long story). The guy that had it (a well known pro) in fact gave it to me due to the history I had with the board. Very nice of him. I have ridden the board a few times. Bit of a novilty for me but fun to ride. Likes a nice steep wave as this design was made for places like Ulus. Have ridden it in solid surf and it holds in well. One of my goals is to surf it out at Ulus one day . Reckon everyone should ride a single (2+1 for training wheels) at some point. Teaches you a lot about rails and weighting. I've always got at least 1, normally a 2+1 because they're more versatile. Rode a 6ft bear wombat (hey topher ) as a daily board for 6 months but think they're more of a niche conditions board once you go short. Glad you like the board Glamarama, always good to know that a board goes to a good home. Have you played around with the fin or stuck with the Gullwing? 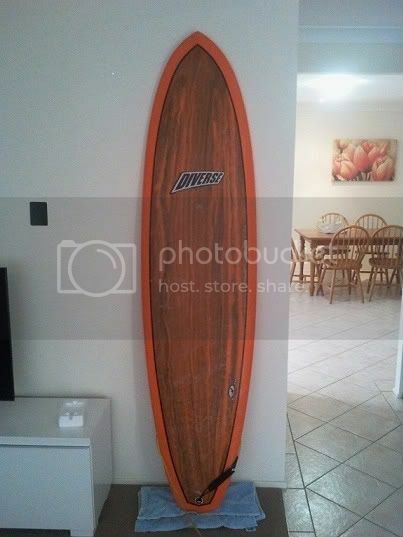 Beerfan, i have a 7ft diverse sg widowmaker they re a good board, more versatile than you d think and easy to ride. Havent ridden mine for a while but i ended up using it as a longboard alternative. alakaboo wrote: Reckon everyone should ride a single (2+1 for training wheels) at some point. Teaches you a lot about rails and weighting. The weight thing for sure, its nice to have to be light on your feet even as a larger person, took a bit of getting used to after riding 3 fins but the returns great. Thrusters are capable of doing so much more and going far more places on a wave.That's why they are so popular.